Mammillaria bocasana, commonly known as Powder Puff Cactus, is an attractive cactus native to central Mexico. It is found between 5,400 and 7,500 feet (1,650 and 2,300 m) above sea level and grows on canyon walls, in volcanic rock and in semi-desert environs, often under bushes of native plants. This cactus is protected from collecting in the wild in Mexico. 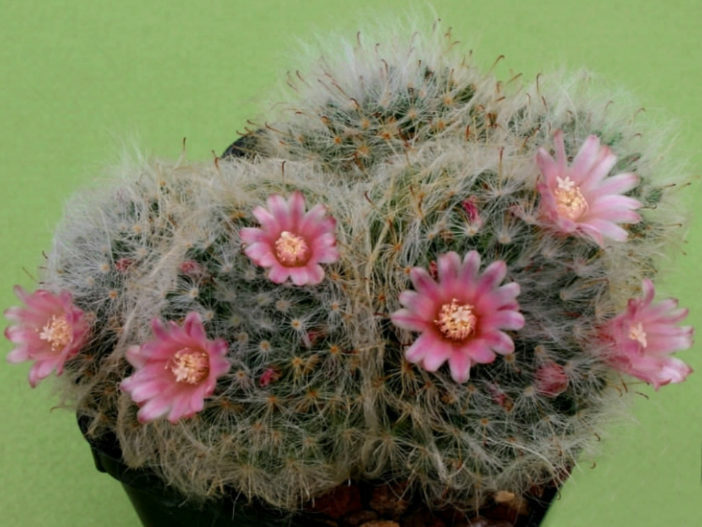 Powder Puff Cactus grows rapidly and produces small round offsets, which cluster around the parent plant. The body of the cactus is blue-green, stocky and made up of short stems that hug the ground. The entire plant is covered in silky white hairs that cover the reddish-brown spines (one hooked) that also coat the entire cactus. The flowers are small, white, yellow, pink or red, depending on the cultivar grown. Fertilize Powder Puff Cactus in spring with a 5-10-5 liquid fertilizer. Continue to feed the potted plant in summer, every month. Suspend fertilizer in fall and winter, when the plant is dormant. Other than that, you need to watch for some pests such as whiteflies and mites. This cactus likes to be a little pot bound and only need repotting every 3 to 5 years. Powder Puff Cactus can be propagated from seed or offsets. Seedlings take a long time to form adequate plants, so the best way to start some new plants is from division. The little offsets that cluster around the parent plant are easy to pull away. Lay the offset on the counter in a warm, dry location for a day to form a callus. Plant it in cactus mix or sandy potting soil.